Originally from Snellville, GA, Mitchell earned his Bachelor of Science in Sports Medicine/Athletic Training from Valdosta State University. He then went on to earn his Master of Science in Sports Medicine from Georgia State University while working as graduate assistant athletic trainer at Emory University. Beginning in 2010, Mitch supported Austin Peay State University’s volleyball, softball and women's basketball programs. In 2012, he moved on to the University of New Orleans, where he worked with its Division I women's basketball team, as well as both the men's and women's tennis teams. Mitch began with Gwinnett Medical in September 2013, where he is the head athletic trainer at Dacula High School. Mitch is a Certified Strength and Conditioning Specialist through the National Strength and Conditioning Association and is Functional Movement Screen Level 2 expert. What happened to the days of youth sports being fun? What happened to teaching sportsmanship and other life lessons with youth sports? It seems like monthly I see a story of kids between the ages of 8-12 participating in high level athletics, playing on “elite” teams and practicing multiple times a week. What happened to playing for the love of the sport and not for some scholarship 10 years down the road? What happened to an offseason for youth sports? Now when I say offseason, I don’t necessarily mean doing nothing. I am a big proponent of multi-sport/activity kids, but playing the same sport all year round is where I have the issue. I hear horror stories of kids playing upwards of 80-100 games per year, which is the epitome of overuse. This is borderline child abuse and I put much of the blame on the coaches but parents have just as much responsibility in this. A parent at some point has to look at what is best for the health of their child. Some of these club coaches, and school coaches aren’t exempt, will ride a “stud” to a championship. Guess what? Eventually that stud, whose body hasn’t matured enough yet to handle these stresses, will break down. It makes me cringe because I have seen the damage this causes. I have seen kids whose arms or knees are shot by the time they do make it to that “glorious” scholarship. News flash, if the kid can’t perform they won’t have that scholarship for long. We need to get back to the days where sport was apart of the community. Where it brought people closer together and taught our children life lessons. We need to stop putting so much pressure on young kids to be the next Lebron James. Let them develop at their own pace and on their own terms. Yesterday a 14 year-old boy from Valdosta, GA passed away after being struck in the head during a baseball game. An athletic trainer was on-site but from the sound of the reports the young man’s chances of survival were slim. This is an absolute nightmare for an athletic trainer. We prepare for situations such as this in hopes of giving the person another chance. In our training we learn immediate care of emergency injuries such as CPR, AED administration, and spineboarding techniques. But sometimes a perfect storm brews and an injury occurs where the chances of survival are bleak. At that point, our goal as athletic trainers is to hopefully increase their chance of survival with immediate care. This young man left Moultrie, GA in a helicopter headed to Tallahassee with a great chance of survival than had this occurred at home because an athletic trainer was there. This is another example of why every parent should be screaming at the top of their lungs to have an athletic trainer at their school. Through our training and expertise, we increase the chance of a good outcome in the midst of a terrible occurrence. I thank God that I have never had to deal with a situation such as the one in Moultrie but I have experienced the anxiety of dealing with an emergency. Afterwards is when the anxiety can be difficult to deal with. I pray for the family of the young man, the Valdosta Community and the athletic trainer who responded to this tragedy. We all strive to eventually reach a certain level of comfort in our life (bigger house, better job, nicer car, etc.) but to achieve success in life, we must get out of our comfort zone. Frederick Douglas said, “If there is no struggle, there is no progress.” Meaning if something is easy, it isn’t making you or those around you better. “If it doesn’t kill you, it only makes you stronger” has always been one of my favorite quotes. Successful people don’t look for the easy road, they hit the uphill trail with great determination and will. To be better in business/career it may mean stepping into a position that may not be “your cup of tea”. In fitness, it means working on your weakness. I have seen greater progress since evaluating my weaknesses and attacking them with a greater intensity. Stepping out of our comfort zone can be beneficial in all walks of life. I used to look to stay within my comfort zone, and wondered why the wheels were just kind of spinning. As we get close to reaching the end of the first quarter of 2015, I think it is time to revisit the goals that I mentioned in my post Goodbye 2014, Hello 2015!. Well for starters, my wife and I did not take long in purchasing our family’s first home. I say first, but I hope it is our last….that process was trying. The negotiations and waiting probably aged my wife and I by 10 years. We also learned to have patience as we began to get caught up in the excitement of touring houses. Thankfully we had some outside eyes to help keep us grounded and to keep us from making a mistake we may have regretted. On February 5th, we finally closed on this house! I don’t know that we could have found a better house for our family. Plenty of space, an office for my wife who works from home, a closer ride to work for me, and an area that is still not too crowded. This house did take a lot of work though, we had to put a lot of hours in painting. Every room in this house has been painted except for 2. It is finally beginning to feel like OUR space and OUR home. I am learning as a new homeowner that there is always something to do or some sort of project you want to do. As we began searching for homes, I made it known that I would like a space to create my own weight room. In this house, it looks like it will have to be my side of the garage. If I can clear it with the wife (all you married men know what I am talking about), I’d love to turn one side of the garage into a Palace of Pain. I’m talking about an area for clanging and banging of iron. This may not be possible right now but a man can dream right?? I also set a goal for myself to reach a 400 lb squat and a 450-475 deadlift. As of the end of March I had completed a 16 week program following the Juggernaut Method. I usually do my own programming but sometimes I like to take the thinking out of it and try something someone else has found effective. I gained around 30-40 lbs on my squat and deadlift. I found some weakness that are holding me back, especially in my deadlift. My grip became a factor as I was working with higher loads and plan to make that more of a focus in my training. Currently I am working at a high rep and lower weight to help with some hypertrophy and will begin back to lifting heavy soon. As for my posting goals, I have stuck with my once a month goal and this will actually be my second for March. It is just hard to find the time and the ideas to write about. I am trying to make a concerted effort of writing down ideas as they come up. So far I can’t complain about 2015, the weather could be better but I know there will be sunny days ahead! The NATA for National Athletic Training Month has selected “We Prepare, You Perform” as the slogan for the month. This slogan shows what sets us as athletic trainers apart from other medical professions. Athletic trainers prepare for any situation that may arise so that athletes may participate as safely as possible. I tell my kids often to play your heart out, and we’ll be here to fix you. Athletic trainers are working hours before practice and games to ensure that athletes are able to perform at the safest and highest level possible. From taping to setting up hydration states at practice or games, they are working tirelessly to prevent emergency situations. Athletic trainers help athletes prepare for their sport through preventative strengthening and flexibility programs. Athletic trainers work closely with strength coaches and other coaches to create these programs in order to make the athlete more resilient and move more fluently. Injured athletes also need athletic trainers to help them prepare to return to the highest level possible after injury. Whether it is your run of the mill ankle sprain or an ACL reconstruction, athletic trainers work daily with athletes. They develop rehabilitation programs to help restore range of motion and strength. Athletic trainers also implement strength and reconditioning programs to help that athlete return back to their previous level and maybe even better, with the ultimate goal being to prevent re-injury. Not all situations are avoidable, so athletic trainers also prepare to react to emergency situations. Long before a practice or game occurs, athletic trainers are creating and implementing, and rehearsing their emergency action plans. Through thorough planning and execution of these plans, the evaluation and care of all injuries runs smoothly. Well thought out emergency action plans help coordinate care and make sure that everybody knows their role in the case that an emergency does occur. Much of an athletic trainers work is done before the craziness of sports has even begun, but it never stops as we are always preparing ourselves to be ready for any situation. We are continually educating ourselves on the newest research, mentally going over situations that COULD occur, and working to maintain the safest possible environment for athletes to participate in. Mike Robertson, a strength coach out of Indianapolis, posed this question in his recent blog post. It made me think about why I train and why I continue to make it a priority. Sure, most people say they workout or train for something or to look good/make their clothes fit better. As I have gotten wiser in my “old age”, my mindset for training has shifted. I now train to become stronger and move better. Looking better will usually follow suit. My ultimate goal isn’t to lift a car, although that would make me one bad dude. I train to be stronger. To me, strength also produces resiliency. In college, I battled with low back issues primarily due to poor strength in my hips. Now, I have less back pain that is the result of injury. Sure, my back may feel toasted after a heavy deadlift session, but after proper recovery I am stronger. Strong muscles can help protect the weaker parts of the body such as ligaments or vertebral discs. Strong muscles can help maintain safe and proper positioning, and can make everyday activities easier. For instance, my wife and I will be moving from our apartment into our first house soon. Where I may have previously struggled with a large cumbersome piece of furniture, now I anticipate being better prepared and able to handle these awkward loads much easier. I may only feel like a truck hit me afterward, as opposed to a train. I train to move better. Admittedly, I have never been and still am not the most limber human being in the world. I was never very good at the sit and reach test they made us do during P.E. in school. During the butterfly stretch, my knees were up by my ears. To say the least, my mobility was terrible. My current training, through my full range of motion, has made me much more pliable. I am now able to touch my toes with relative ease, and can get down into a full deep squat without any problems. I am able to “lift with my legs, instead of my back” when lifting up heavy objects. Better movement quality and efficiency means less injury. Lastly, I train to scare that boy showing up at my front door 16 years from now to take my little girl out on a date. My father-in-law graciously once told me (as he gripped my hand), “You may be bigger than me, but I can still kick you’re a$$”. I now echo his sentiments. Sure everybody works out to look better, but maybe we should re-evaluate why we workout. Really think about why you train. What does your training reflect? Let me know why you train! Goodbye 2014! You have been great to me and my family. This year, we had a wonderful addition to our family. 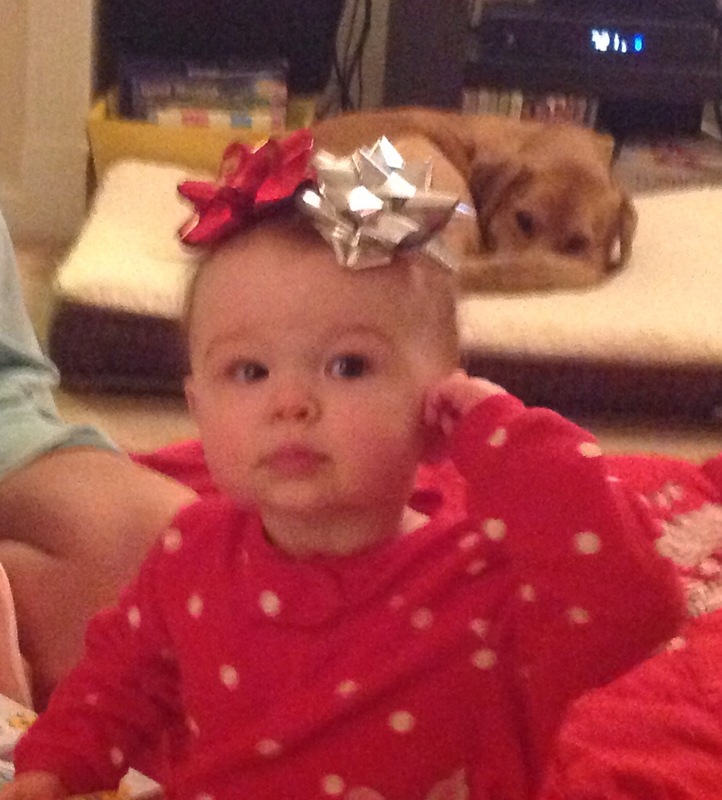 Ella Marie has been my crowning moment so far in this life. She has changed our lives in an immense but unbelievable way. She lights up my world when I am having a rough day. Hearing her and my wife get into giggle fits is awesome. As great as 2014 has been, I look forward to an even greater 2015. It is customary for many people to set resolutions for the upcoming year. That is the goal of this post today, but I am going to take a different thought process into it. Many people set resolutions as “I will try”. I think this leaves a lot of room for failure. I am going into this year with the mindset of “I WILL”. It means that you are going to find a way to make things happen. The first “I WILL” is more of a “We WILL”. A family goal of mine and Christa’s is to get us into our first house. We have begun the process of looking and I am excited about beginning this process. We have definitely grown out of living the apartment life….especially when your upstairs neighbors love to vacuum and drop things right when you are attempting to put down a little girl. Also, adding a little one to your family requires a lot of space, which an apartment does not allow for. In 2015, I will also average at least 1 blog post a month. Looking at the review of how this blog did this year, I was strong at the beginning of the year. Around the time that little girl came around, things got crazy and the blogging got pushed to the back. I think an average of 1 post a month is achievable. I see this blog as a way to teach the everyday person how to take care of themselves or prevent injuries. Now to start thinking about topics! In 2015, I will squat 400 lbs and deadlift between 450 and 475. For a tall human being like myself, these numbers are pretty substantial. A 400 lb squat would put me at 1.5 times my body weight. There are other goals that I have throughout the year but in looking at what are the things that I enjoy or value the most, these were goals that would affect them the most. What are your goals for 2015? Are you thinking I will try or I WILL? I wish you all a happy and fruitful 2015. Gluteus Medius: the Root of Chronic Leg Pain? Dealing with knee pain while running? Or even shin splints? What about a history of lateral ankle sprains? These may all be a symptom of a weakness at the hip, specifically weakness of the Gluteus Medius. We have all heard of the Gluteal Muscles but may not have heard of the Medius. The Gluteus Maximus gets all the glory for making a nice back side but the Medius may have greater implications in the the health of the lower extremity. The GMedius originates on the posterior aspect of the Ilium or the top part of the pelvis. The tendon inserts into the lateral surface of the greater trochanter of the femur, or the bony part of the hip on the side of the hip. The Gmedius’ primary function is abduction of the hip or moving the leg away from the midline of the body. It also contributes to most of the actions of the hip but for the sake of this topic we will focus primarily on abduction. 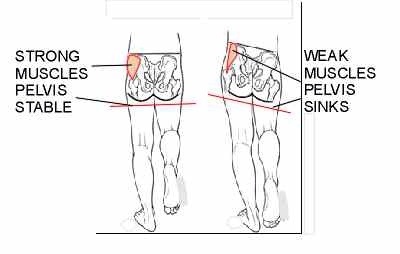 The Gmedius is also responsible for preventing the opposite side of the pelvis from dipping down while in the stance phase on that side. This helps prevent the Trendelenburg Gait which is pictured below. By creating stability in the frontal plane at the hip, it also creates stability in the same plane for the knee and even down into the foot. 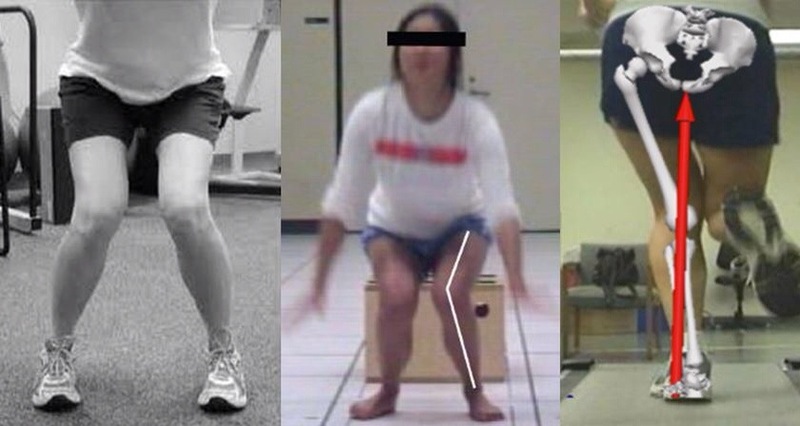 By limiting the amount of valgus moments at the knee during functional movement, pronation of the foot is also limited. Some individual difference can occur as we are all shaped different but we can hopefully prevent overpronation of the foot by controlling the knee through the hip. Below is a picture to visually explain what occurs when a valgus moment occurs in the knee. Patellofemoral pain syndrome is used to describe injuries such as patellar tendinitis and patellar chondromalacia (wearing away of the cartilage under the knee cap). Much like the IT band, these chronic injuries are caused by the decreased thigh abduction and external rotation. The lack of frontal plane stability at the knee caused by a weak GMedius can lead to poor patellar tracking mechanics through the femoral groove. The increased valgus angle at the knee also does not allow the quadriceps to work at efficiently as possible. This poor angle places more stress on the patellar tendon with high loads. This, if not corrected will lead to patellar tendinitis. Probably the most known athletic injury is the ACL injury. It can lead to surgery and 6-9 months of intensive rehabilitation. The noncontact ACL injury can be prevented with a strong Gmedius. One of the mechanisms of tearing an ACL is rotation at the knee. The control of adduction and internal rotation of the knee through the GMedius can help protect the ACL in activities such as cuting and landing. Proper cutting and landing is important but a strong Gmedius will allow the body to absorb higher loads without a collapse of proper mechanics. For a quick and functional assessment my go-to test is the single-leg squat. This test places us in a position where we must have great control of the pelvis and knee to complete correctly. I first allow the patient to do it without any instruction other than visually how to do the exercise. The keys to visually assess are the amount of valgus angle at the knee. I also am looking at the hip and foot. If the arch collapses immediately or the knee angle gets better with some sort of support at the arch, then the issue may be more at the foot and ankle. But if the arch is compensating due to the lack of control at the knee then the hip will be the issue. I like to video my athletes while doing this so they can see the dysfunctions that are occurring. After I have seen how they are moving without any cues, I like to teach them a few cues so they can feel how to move correctly. My main cue is to keep the patella over the second toe. This cue seems to be the biggest help. I have a couple go-to exercises that I use for strengthening of the GMedius. While the patient or athlete is still symptomatic or non-weight bearing the clam exercise and the sidelying hip abduction exercise have been an essential part of my rehabilitation. These can be advanced through bands or weights. An important note with my sidelying hip abduction exercise is I had a bit of hip extension. This has lead to a greater focus on the GMedius and a greater burn when my athletes are doing it. It is also important to maintain a neutral spine while doing these exercises as it can lead to compensations. As the athlete becomes more functional I like to progress to exercises that put them on their feet. The miniband side shuffle is one I rely on often and have found great results with. The Stepdown exercise is also a staple with the emphasis being on the eccentric phase of the exercise. I also like to implement the miniband around the knees with exercises like hip bridges and squats as it puts a load on the hip abductors while performing other functional exercises. Clinicians, what other assessments are you using for general glute weakness or Gluteus Medius specifically? What exercises are you using to strengthen the Glute Med?